ENDO-WHITE is indicated for discoloration of endodontically treated teeth using an internal method. 1. In an X-ray image assess the quality of canal filling and the height of the edge of the alveolar process. 2. Open the chamber opening from the lingual (or palatal) side. Remove the filling from a tooth chamber and canal to the depth determined based on an X-ray image. 3. Seal the canal opening with a glass ionomer cement with the thickness of 1 mm as it will separate the filled canal from the whitening gel. 4. Screw the applicator onto the syringe with the product. Fill the tooth chamber with ENDO-WHITE. Directly on a portion of the product applied place a ball of cotton wool, leaving 1-1.5 mm of free space in order to close it with a temporary cement. Avoid contact between the product and soft tissues. 5. Use a non-eugenol temporary cement to close the tooth chamber. 6. The procedure above should be repeated every 3 - 5 days until desired outcomes have been achieved. A treated tooth may be susceptible to mechanic damage, therefore a patient should be informed. 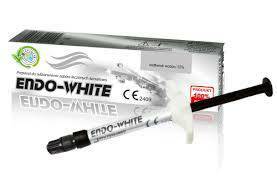 ENDO-WHITE until the level of the glass ionomer cement closing the canal opening. After a discoloration procedure place non-hardening calcium hydroxide for 14 days to increase pH and inhibit the activity of osteoclasts. This procedure strengthens the tooth tissue that has been weakened. Then, clean and fill in with permanent filling. The product is for multiple use, whereas the applicator is for single use. Multiple use of the applicator may be associated with a risk of secondary infection.